Yesterday we took a trip back to my husband’s home town. Mainly because we hadn’t been there in 18 months, and we wanted to check in on some things (and buy some of his favorite kielbasy). Most of the family is gone. Moved, passed away. A few friends still in the area, but not many. It’s a deeply depressed coal mining town. We found my husband’s old house on the market again. Like hundreds in the area. We were lucky to sell it quickly 12 years ago when my MIL moved to a retirement community in Pottsville. The cemetery. Covered in fog and snow. Too wet, windy and cold to try to take pictures. We were there to check on the gravesites, before paying our yearly maintenance fee to the man who the church uses to maintain graves for those who are no longer local. The cemetery is on a huge hill outside of town. At 1800 feet elevation according to our GPS. 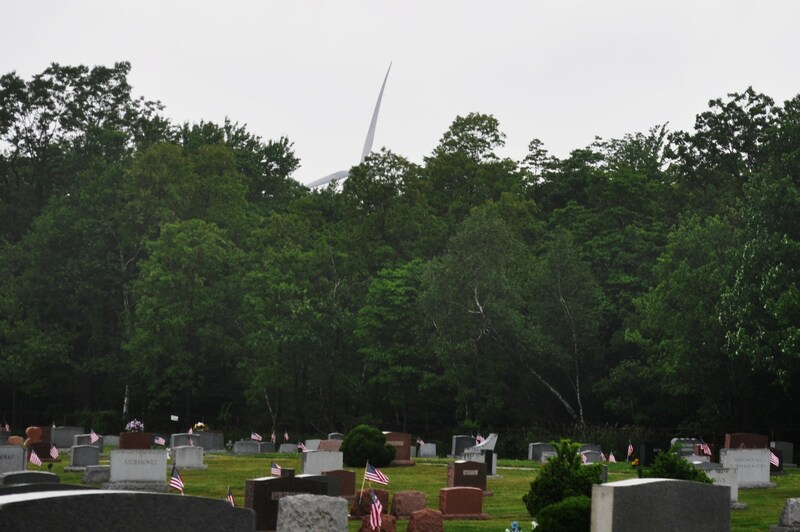 This picture, taken last year shows the wind turbines installed on the ridge. Yesterday we couldn’t see them, the fog was so thick. As for getting that kielbo, we forgot that Kowalonek’s gets really crazy at the holidays. Lines out the door, through the parking lot and around the corner. Not our idea of what to do in the rain and wind. We decided to head south to Manheim and look for fresh kielbasa at the Roots Country Market and Auction. We found some at Hummer’s meats. A three pound ring of fresh, not smoked kielbasa. It almost is as good as his hometown version but not quite. We also picked up some of Hodecker’s celery, a real delicacy harvested in the fall and early winter. The web site is from the Bed and Breakfast at the farm where the celery is grown. 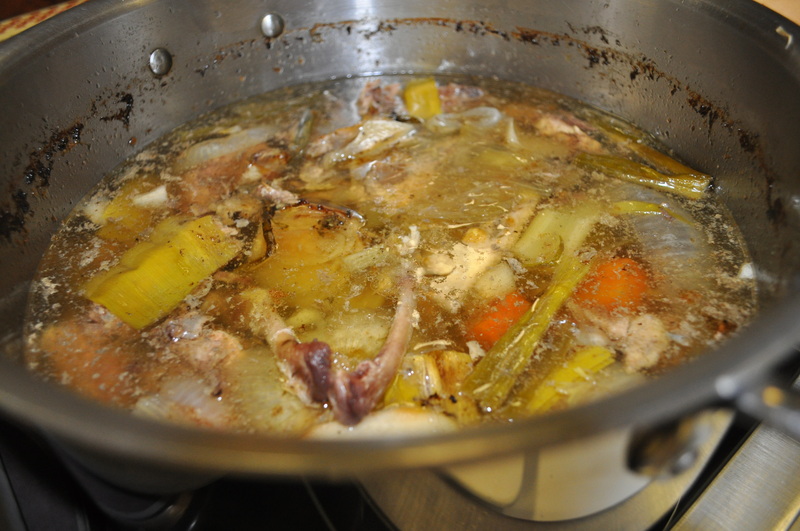 Some of that celery went into stock tonight. The leaves were frozen for later use. We took the back roads up and back. On the way up, we stopped at the Peters Orchards to get some gifts like this one. Cranberry salsa. 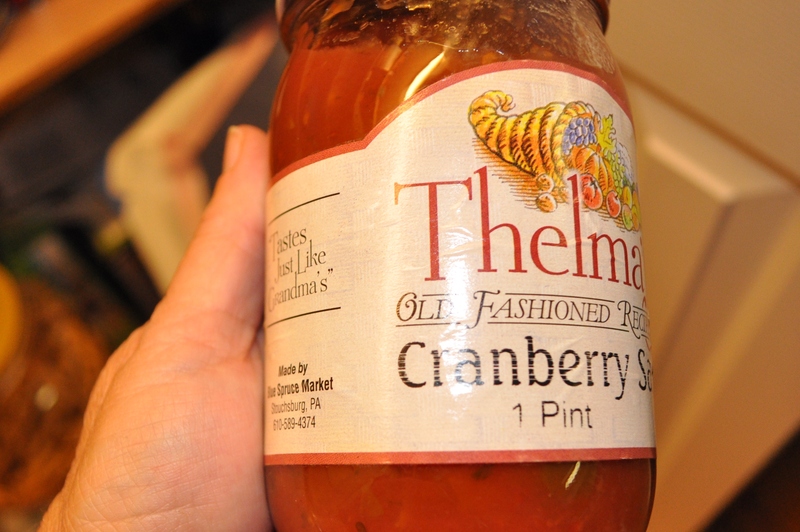 Made in PA. Peters carries a nice selection of hot pepper jellies, all sorts of jams, honey, syrup and much more. They are open year round and are on the way to Carlisle on Rte 94. My husband couldn’t resist the molasses cookies either. All in all, on a rainy blustery day, we had a good time, even though traffic was awful on the way home. I have to admit, I don’t miss that commute in really bad weather up I-81. Now, off to bake cookies and other goodies using things I picked up at the market. Posted in Day Trips, Family, Farmer's Markets, Farms, Food, Locavore, Real Food, Travel and tagged day trips, farmer's markets, farms, Food, foodie, holidays, Locavore, traditions. Bookmark the permalink.